St Edmund’s War Memorial College was opened in 1954 by the Christian Brothers to respond to the call of Catholic parents in the region. It was the first Catholic Secondary Boys’ College established in the Australian Capital Territory and has been educating boys for over 65 years from Year 4 to Year 12 in the Edmund Rice Tradition. The College is part of the Edmund Rice Education Australia (EREA) network of schools following the vision of Edmund Rice. The College is an inclusive community, committed and supportive of its traditions and strives to educate and inspire the boys; achieving a synthesis of faith and culture to foster a caring family spirit where boys can realise their full potential. In 1925 the Christian Brothers contacted Bishop Barry the Bishop of Goulburn to advise them of the plan to start an all boys school in Canberra. In the April of 1938 Fr P Haydon (Parish Priest of Canberra) requested the Department of the Interior to set aside an area of 12 to 15 acres for the school on the southern side of Canberra Avenue. The lease of land on No 5 Manuka was prepared in July of 1946 and signed four years later in October of 1950 from the advice of the Acting Administrator of the Parish Fr Twomey. The agreement was then made out to the Trustees of the Christian Brothers. A further twelve months later on the 14 October 1951 before the Foundation Stone was laid by Archbishop T McGuire and the first Soil was turned on the 11 November 1951 by the Speaker of the House of Representatives the Hon. Archie Cameron. Building commenced in 1952 and in June of that year members of Parliament who had been educated by the Christian Brothers held a tree planting ceremony along the Canberra Avenue side of the College. This was to mark the Sesqui-Centenary of the foundation of the Christian Brothers. St Edmund’s College was built in memory of all the Christian Brothers students around Australia who had given their lives in the two World Wars. The name of the College was chosen by the Superior-General of the Christian Brothers in 1954 Br E F Clancy. The College was the first Catholic Boys school to open in Canberra and is now the oldest Catholic school still operating here in the National Capital. The first school day for students was 2 February 1954 and there were 330 boys enrolled. The official opening was the 14 March 1954 and was a great occasion for Canberra with the Prime Minister Mr R Menzies, the Leader of the Opposition Dr H Evatt, Cardinal N Gilroy, Archbishop E O’Brien, Bishop G Young and many other distinguished guests along with the Christian Brothers, the students and their families all seated at the front of the College to celebrate the opening and listen to the speeches. The College has grown and now has a student population of over 1100. The buildings have had many extensions over the years and upgraded to enable the school facilities to cope with demands of the 21st century. The College has an Assembly Hall, Chapel, Gymnasium, Technology Centre, Performing Arts Centre, two libraries, beautiful grounds with ovals and a grandstand as well as tennis courts. The Triple Tiara is of Pope Pius X who did so much to spread devotion to Christ in the Blessed Eucharist. 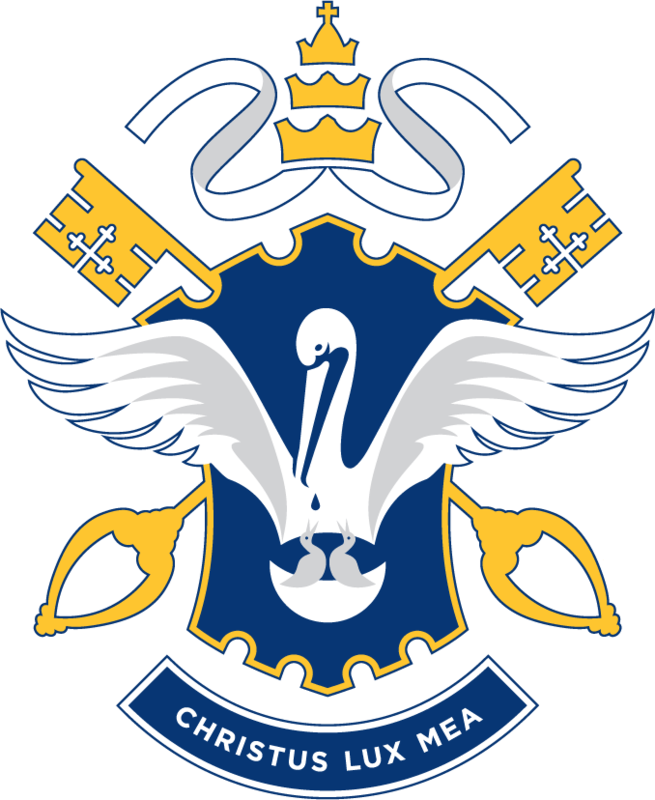 The symbolism of the Pelican to figure Christ goes back to the earliest Christian times and has continued throughout the centuries. The Shield is of heraldic origin with a distinctive shape housing the Pelican. The Supporting Cross Keys are the Papal keys of Pope Pius X. Light, our Leader, and our Love.